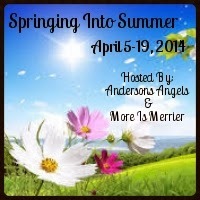 Andersons Angels and The More The Merrier will be hosting the Blogger Opp called, Springing Into Summer Giveaway Hop, which will run from April 5-19, 2014. This giveaway is dedicated to all things Spring & Summer! All giveaways must be at least $25 and can be anything related to spring or summer. Sign ups are below! ~ All participants will be responsible for reporting their posts and will be removed from the event if not reported on time. ~ Questiona? Please contact Trista at andersonsangels2010@gmail.com or Kay at klcmaher@moreismerrier.com with any questions! ~ DEADLINE: April 1, 2014 *Linky will close and signups will no longer be accepted! ~ Join The Andersons Angels Events, not required, but lots of fun! *SPONSOR US: Interested in sponsoring Andersons Angels and The More The Merrier for this event with a grand prize? Kay at klcmaher@moreismerrier.com for additional details and learn how we can work together! Please help us promote this event! Place the event button on your sidebar or place the info on your events page. Tweet the message below, Hit the Pin It button or share on Facebook or Google+ Pages. Thanks for helping in spreading the word!